Yesterday was Courtland California's Pear Fair for 2015. We have never been and thought it would be fun. Looked on Saturday to see what the agenda was. Started out with a 10 mile run at 8 a.m., a 5 mile run at 8:30 and a kid's run after that. Nope, nope, nope. Not interested. But it did have a pancake breakfast at 8 until 10:30. Okay, sounds good. We got there around 9:30 and headed out to have breakfast. It was good, but boy was it slow getting to us. The sausage was about the best I have ever eaten. We each got a plate with two pancakes, two sausages, two pear haves and some blueberries. Yummy. Love the moose in the middle. The moose was cut out of Australian fabric. I thought that was funny. It really made him stand out, though. Pattern is Whimsical Garden. I made one like it a few years ago. Love these dresses. They are done in 3-D. Very nice. 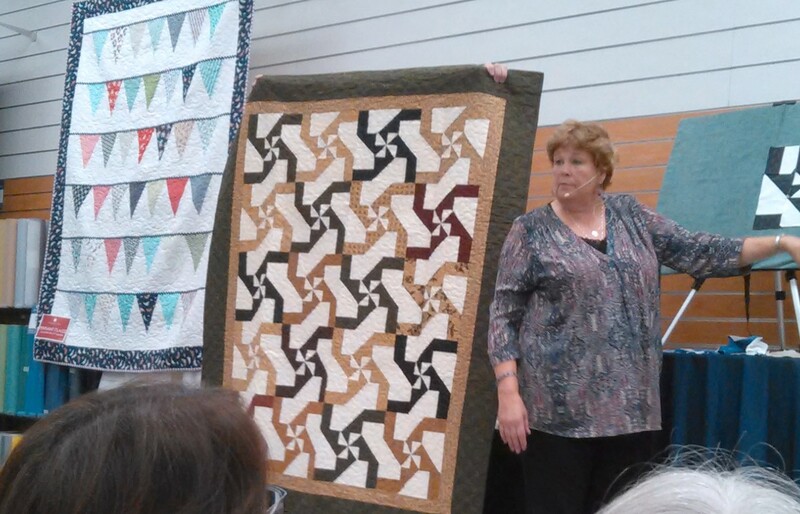 This quilt was folded over the risers for display. Wish we could have seen the whole quilt. It was stunningly beautiful. My husband and I had a good time at the fair and show. It was quite small and quite hot there. We only stayed about 2 hours and most of that time was waiting for our breakfast. We plan on going next year. Note to self: go in SUV as the parking was in a very uneven field. Hard on the little car's underpinnings. Also bring home a box of pears to can. We walked out of there with no pears in hand. Silly us. May have to drive back into that area and find a fruit stand. Pears were in practically every field we went by. Great day. Came home and took a nap after all that sun. My Secret Pal from my guild - River City Quilt Guild - gave me all this last Tuesday. Best Secret Pal EVER! She [or it could be he] always includes beautiful fabric. This month she also gave me 9, yes nine, Row by Row patterns. Most are from California, but one is from Brooklyn, New York, and one is from Stowe, Vermont. The ones from California are from all over the north state. Represented are Elk Grove, Fairfield, San Mateo, Quilter's Corner in Sacramento, Berkeley, and Vacaville. The one from Fairfield has the material. The rest are the patterns. I will work on Fairfield first and let you see what it looks like. It is pretty cool with sailboats and all. I had read and seen the ads for the Row by Row experience but had not bought into it. Well I'm into it now. 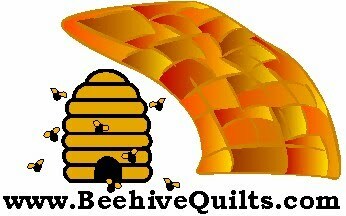 I have to go shopping this afternoon and am planning on going to a couple of local quilt shops and get more. 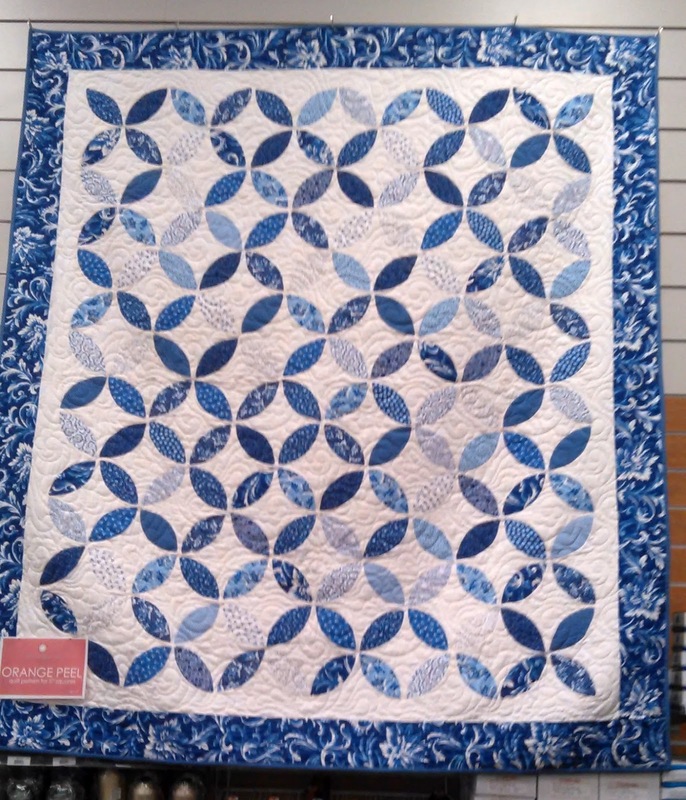 Then I am going to contact my relatives that live out and about and ask them to send me the patterns from their local quilt stores. I will pick and choose the ones I want to put into a quilt. 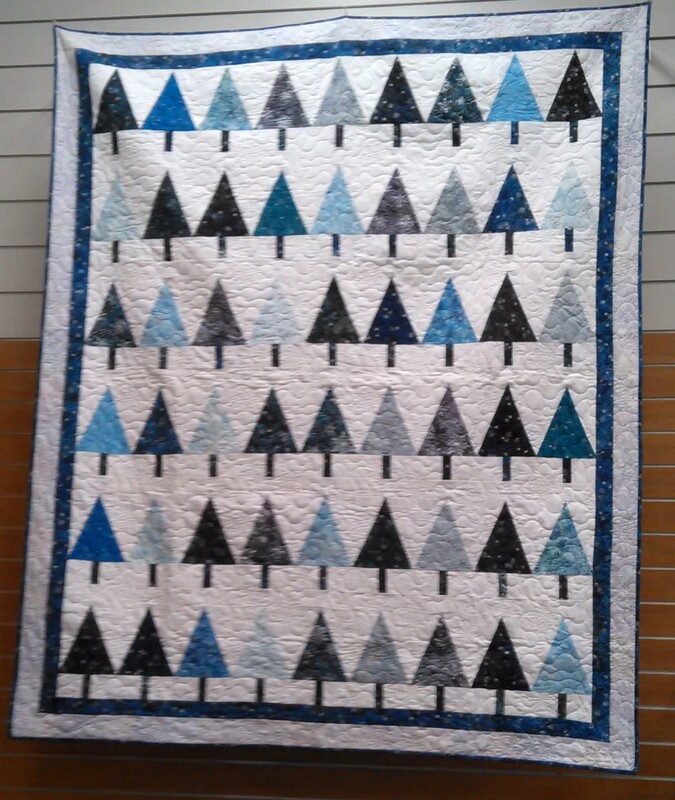 Maybe some day I will include all into several quilts. What fun this will be. Okay. I know Meissners puts these seminars on to sell product and I totally buy into that premise. Literally! I buy into it! I needed a light yellow and some pink fabric for a Bonnie Hunter quilt I am working on. The pink was 60% off and since I will be cutting it up into 5 inch squares, it will work perfectly. The yellow is great because I didn't want a bright yellow. 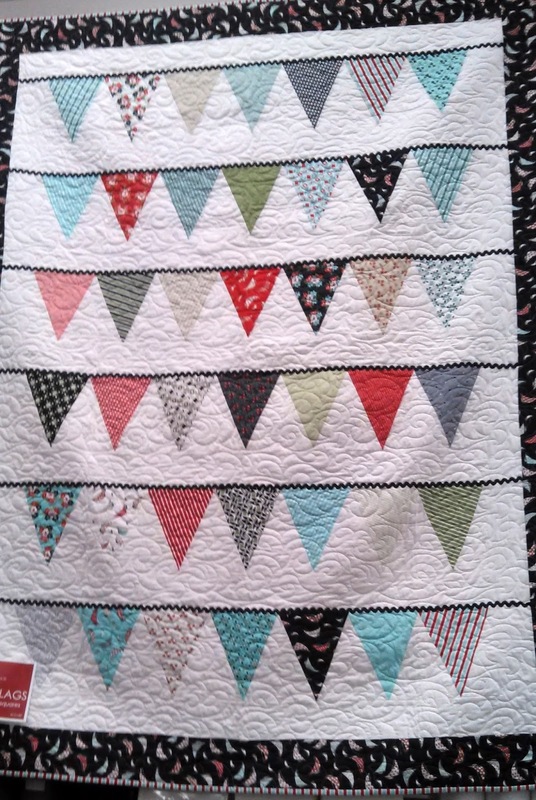 It will be the setting triangles to be used in a pink and orange quilt. The green fabric was in their markdown bin for 50% off on two yards. Can't have too much green fabric - or any color for that matter. Jenny was selling her Block magazine back issues. Since each book has her patterns in it and interesting stories about them, I bought them all. Cheaper than buying her individual patterns and more interesting, too. I like them so much I came home and subscribed to get them upon publication. She signed the one. Thanks, Jenny. 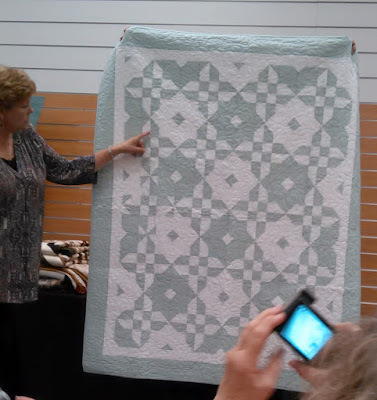 One thing Jenny is known for is making quilting easier. To do that she often develops her own templates. I already have her large tumbler block template and have made a beautiful quilt for my granddaughter, Faith. I decided I needed her regular size and her mini tumbler template, too. I can see a cool looking border using the mini tumbler. She had on display her orange peel quilt. I had to buy that template so I could make that quilt. It is the football looking one. She showed a super easy hexi quilt by using the half hexigraph template. So I bought her large and small one of those. 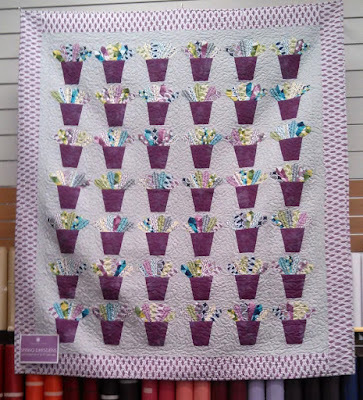 Must make an easy Grandma's Flower Garden quilt or at least a table runner. Then she displayed the cutest pink quilt where she used her small triangle to make. I have to make that, too. Hmmm. I have sooo many projects I want to do. But now I have the tools to do some of them if I ever get around to it. 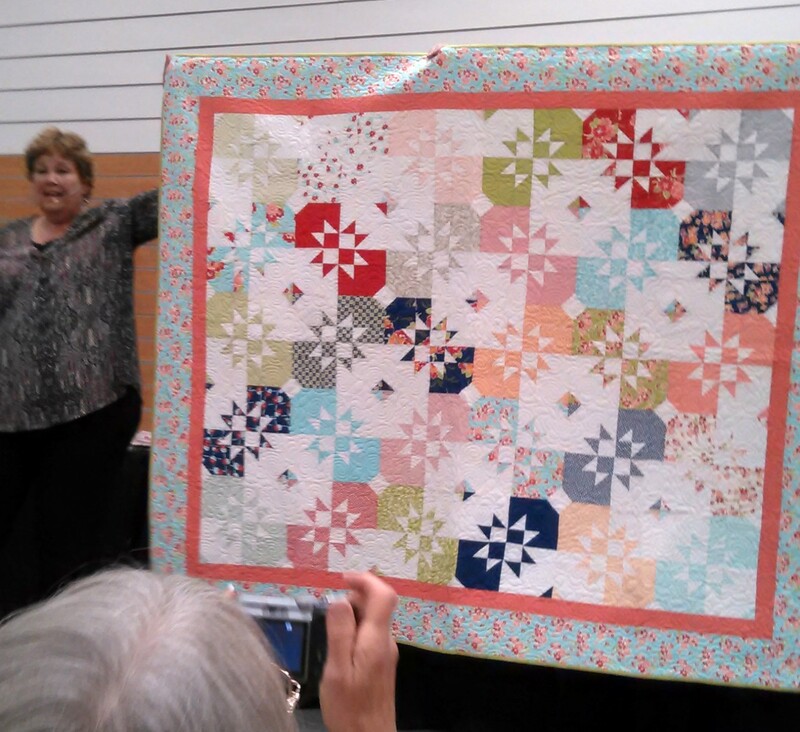 Jenny also teaches using pre-cut fabrics. I am a sucker for charm packs. I bought three very charming ones. 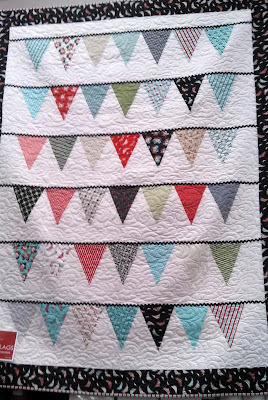 I see a darling baby quilt coming from these. Lovely. Now I just have to use them all. Jenny Doan came to Sacramento! 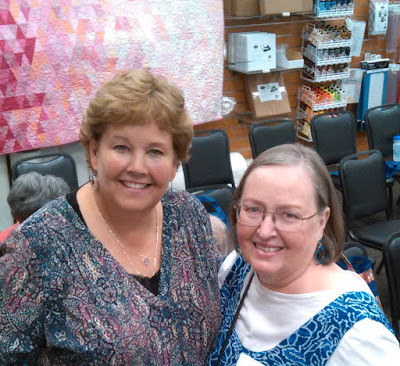 Meissner's Sewing of Sacramento (http://www.meissnersewing.com/) hosted Jenny in a four day, fun filled seminar. Wednesday Jenny gave a trunk show. 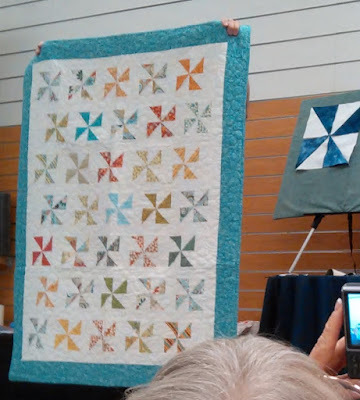 Thursday, the day I attended, She gave a full day explanation of how Missouri Star Quilt Company (https://www.missouriquiltco.com/) came to be formed and what they do on a daily basis. 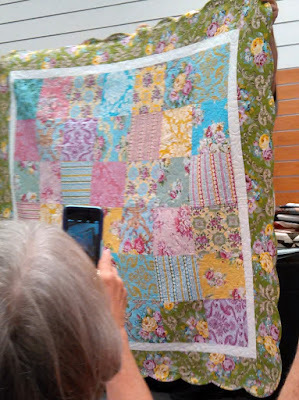 She showed us quilt after quilt after quilt. She told us stories about her kids, her husband and her life in Hamilton Missouri. There were 250 people there to oooh and aaah, laugh and even cry. That was Thursday. 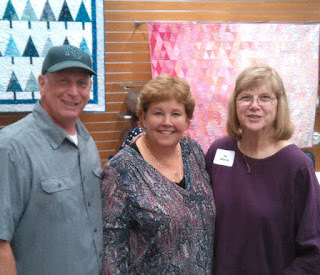 Friday (today) she is giving a quilting class. I did not sign up for it because the description was for beginning quilters. I am not a beginner, but after yesterday I am truly sorry I did not sign up. She is truly a remarkable person and makes it fun to be with her. Tomorrow, Saturday, she will re-do what she did yesterday. Jenny and me. Don't you love that pink quilt behind us! Venita and I attended together. Pat Miljarek attended, also. She grew up in Spreckles California, as did Jenny. When Jenny came on stage and started welcoming us, she saw Pat and stopped and talked to her directly. Then explained to the audience they came from the same small down just south of Salinas California. With tears in her eyes, she told Pat how happy she was to see her. 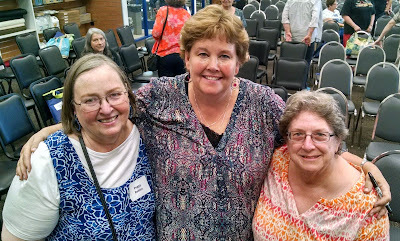 During the break, Pat was able to get a picture of her and Jenny and Jenny's husband Ron, who grew up in Salinas. I took a camera with me but the battery died after taking just a few pictures with it. So most of the following pictures were taken with my phone. 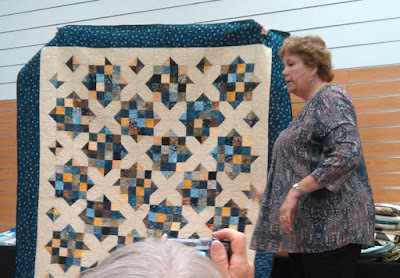 The quality is not the greatest but you will be able to see some of the beautiful quilts that were displayed and discussed during the seminar. The above quilt was made with layer cakes. Jenny explained how to scallop a quilt and then how not to be afraid to do bias binding and how easy it is to sew it on even in the grooves of the scallop. It does make the quilt more charming. But so does that fabric she chose. Pinwheels. Offset them so you do not have to line them up perfectly. Plus it gives more motion to the quilt. Jenny said she was making a bunch of Dresden plates when someone put her large tumbler template down on top of one set. The above quilt was born. Charming. 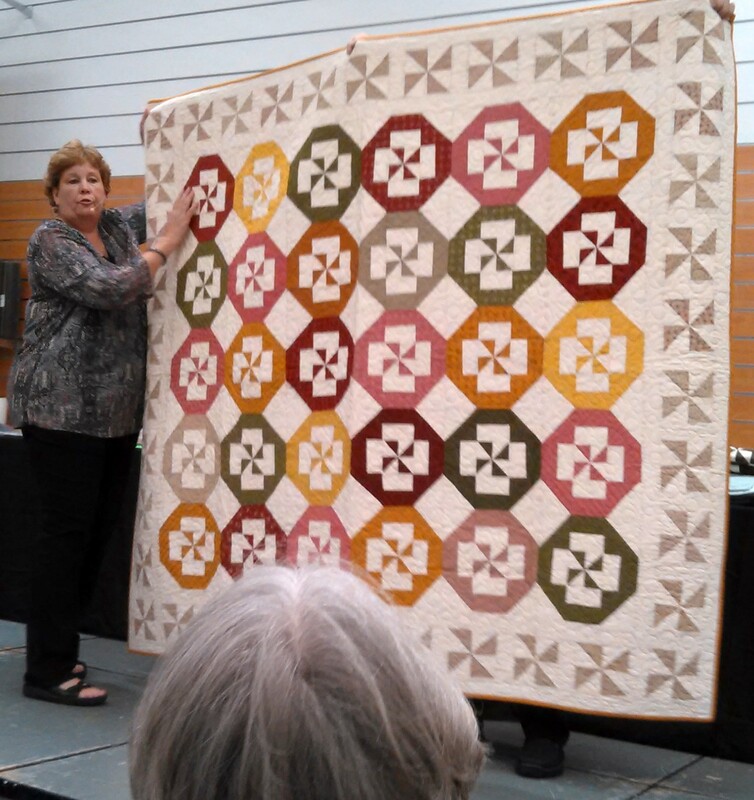 This quilt is called Orange Peel. Venita and I wondered why it was done in blues. I like it though so much that I bought the template to make it. Jenny's Disappearing Hour Glass quilt done using a package of layer cakes. 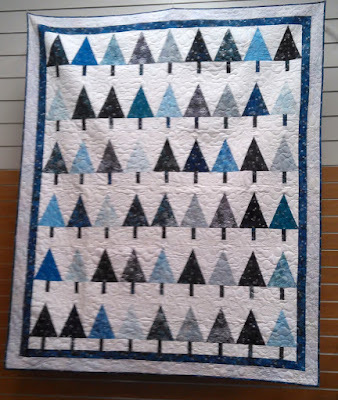 A simple and quick baby quilt made using one charm pack package. Too cute. All the quilts Jenny showed us has had a tutorial made about how to make it. Her tutorials are on You Tube, but you can also get an app that has them all listed with a link to each of them. I have been saving all her tutorials on my Pinterest application but after installing the app to the links this morning, I now have instant access to them. Jenny showed us a turkey she made using the Dresden template. Too cute. There is a tutorial for that, too. Plus on her blog there is a pdf file you can down load for the pattern. The link to it is http://blog.missouriquiltco.com/?s=turkey. In her little town in Missouri, she has been creating an empire. She has several quilting shops now. They have developed a retreat center that will house 40 people (minimum of 10 needed). It is a bed and breakfast set up, with her caveat of "you make both." There is a wonderful restaurant, bakery and hamburger joint if you don't want to cook your own food. There is no hotel in Hamilton, so bring your ten best quilting buddies and stay and sew at the retreat. In case you can't do that, there is a motel 12 miles away. At the end of the seminar, Jenny said quilters are selfish. Yes we are. We spend an inordinate amount of money to purchase beautiful fabric that we cut up into smaller pieces and sew into quilts. 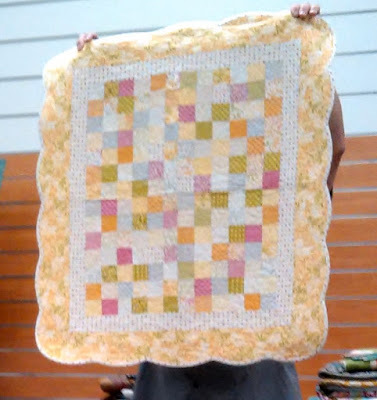 We give these quilts to family, friends, charities and others less fortunate. We put off cleaning, cooking and other household duties. But at the end, we are leaving our legacy with these quilts. These will be passed down to future generations. 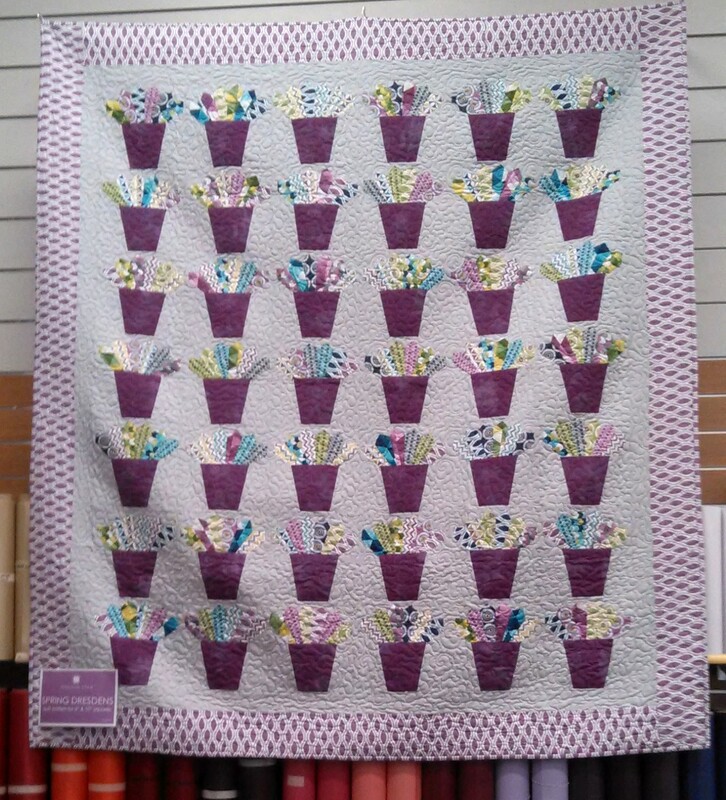 They will be sold at yard sales or thrift stores to excited quilt lovers. They will become dog beds and furniture covers. But in the end they will be our salvation. As Jenny said "when you create, you heal." 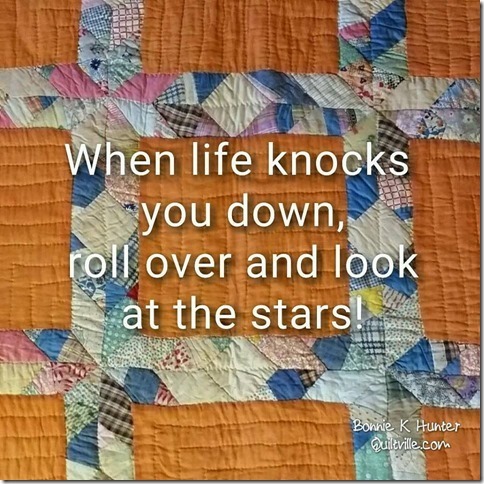 So go heal yourself and work on a quilt.